Don't worry, we'll send you a new one. 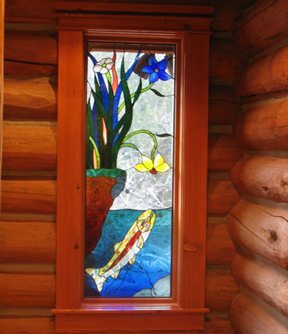 For decorative accent and art appeal, stained glass can provide an expressive and colorful element in a log home. We spoke with Richard Gross, editor of Stained Glass Quarterly, a trade publication for the Stained Glass Association of America (SGAA). The association represents accredited stained glass artists, who have practiced their craft for at least four years and completed a review process to assure their skill set. Placement of stained or art glass installations can be just about anywhere in a home, though areas that are high heat or high moisture will need to have attention paid to ventilation. Gross said that Stained glass windows can be reconditioned and included with extra glazing to conserve energy efficiency, and that many art glass installations have extra glazing for an improved U-value, as well as protection for the art glass from the elements. Salvage or New Art Glass? Whether salvaging an antique stained glass window or commissioning a new piece, it’s important to select an artist or studio with plenty of experience. 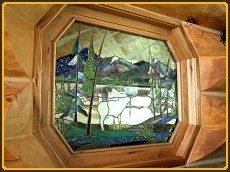 Retrofitting an antique stained glass panel can sometimes be a challenge with sizing, but when designing the windows of the log home, a specific opening matching the dimensions can be easily made. A good way to assess a salvaged stained glass window is to bring in an expert in stained glass restoration. A membership in the SGAA can ensure a level of experience. Ask about recent restoration projects the studio has done for churches or residential homes. If the piece is large, you’ll need to see if recent projects match up to the task at hand. Special equipment is often needed for transporting larger pieces. Many stained glass studios also carry a bond to cover for incidental problems. If you are unable to locate a salvage stained glass window to suit your needs, commissioning art glass may be the way to go. Visit several studios, or if you know of a particularly pleasing window in a local church or restaurant, find out who the artist is. You’ll want to see several pieces of work to get an idea of the artist’s style and develop some idea of what you’d like to have depicted. Gross said that while stained glass can provide privacy while letting light in, some stained glass can be designed to enhance the outdoor views as well using a combination of clear and colored glass. Another technique common in art glass is direct painting onto the glass. This provides detail that the glass itself is not able to depict, and is used quite frequently in religious settings with depictions of saints and angels. The type of glass can affect the value and cost of a stained glass window. Older art glass will have mouth-blown glass, which is considered to be more desirable for it’s slight color variations and minor imperfections. Mouth blown glass is still made and is available for commissioned work but will be more expensive than machine made glass. Machine rolled glass is made robotically and is very uniform in both color and consistency, as well as much less expensive. Lead has been omitted from paint since the mid-seventies, but the lead used in stained glass is very stable and not subject to the same dangers as paints and other products that contained lead. Lead can be affected by acid, so vinegar or acidic cleaning solutions should be avoided. Cleaning with a soft damp cloth is generally the preferred method, according to Gross. Art glass is most effective and most dramatic when placed to take advantage of light. It can also provide illumination while maintaining privacy. Stained glass used in a smaller room can open it up and make it feel larger, especially in bathrooms. Stained glass as an accent or highlight to a bank of windows can add an understated flair to a room. Many log home designs feature walls of windows where smart integration of stained glass can make a dramatic setting more intimate. Around an entrance door, stained glass can brighten a hallway or foyer. © 2019 Katahdin Cedar Log Homes. Katahdin Cedar Log Homes produces the highest quality log homes through a network of certified Katahdin dealers and builders in the most efficient and sustainable way, while helping our clients build the home of their dreams.